Some people experience faster biological ageing than others, and scientists believe this may increase their risk of heart disease, cancer and other age-related illnesses. Biological ageing may play an important role in the development of age-related diseases, such as heart disease and certain types of cancer, scientists have found. Researchers at the University of Leicester and King's College London took part in an international study that looked at the links between telomere shortening and people's risk of various diseases. 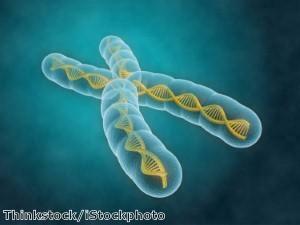 Telomeres are the sections at the ends of chromosomes. They shorten every time a cell divides and therefore become progressively shorter as a person gets older. This means that the rate at which an individual's telomeres wear down can be used as a measure of their 'biological ageing'. Researchers studied the telomeres of more than 48,000 people to see whether the length of these structures was associated with disease risk. They discovered that genetic variants that were associated with telomere length were also linked to the risk of coronary artery disease and illnesses such as bowel cancer. Co-lead researcher Professor Tim Spector, director of the Twin Research & Genetic Epidemiology Unit at King's College London, said: "Our research over the last five years suggests that some people are genetically programmed to age at a faster rate. "When exposed to 'detrimental' environments for telomeres - like smoking, obesity or lack of exercise - they are likely to become even biologically older and consequently be more at risk of age-related diseases like heart disease and cancer." The study, which is published in the journal Nature Genetics, was led by Professor Nilesh Samani, a British Heart Foundation-funded cardiology professor at the University of Leicester who described the findings as "really exciting". He said: "We had previous evidence that shorter telomere lengths are associated with increased risk of coronary artery disease but were not sure whether this association was causal or not. "This research strongly suggests that biological ageing plays an important role in causing coronary artery disease, the commonest cause of death in the world." People who are concerned about biological ageing may want to consider using a high-quality antioxidant food supplement, such as AlphaGuard Plus. Supplied by The Really Healthy Company, this superior product contains a wide range of naturally sourced antioxidant nutrients and complexes, many of which have been shown to have benefits for blood flow and overall cardiovascular health. Furthermore, research published in the American Journal of Clinical Nutrition in 2009 found evidence that supplementation may be associated with longer telomeres, potentially due to the beneficial effects of antioxidant vitamins on levels of oxidative stress and inflammation.